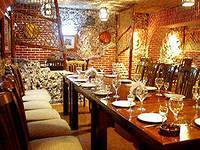 The interior of the restaurant "Karim Bek" combines design, European comfort and eastern generosity. The chef of the restaurant “Karim Bek” will offer you the masterpieces of European cuisine and exquisite dishes, such as a tender chicken, cucumbers stuffed with turkey. There are European hall, eastern courtyard and bar in the restaurant. "The European Room" accommodates 150 people. This bright and spacious room is ideal for corporate events, presentations, anniversaries, weddings and other celebrations. Here you are offered the masterpieces not only European but also National cuisine. “Orient courtyard” is an ancient oriental house with ayvan. You can enjoy the richness of the national cuisine in the picturesque national interior. Good service, a favorable atmosphere and comfort will be the occasion to plunge into this unforgettable fairy-tale atmosphere again. You will be offered the most popular alcoholic and non-alcoholic cocktails in the bar of the restaurant “Karim Bek”. Sitting at the bar, you can enjoy a live performance of the musicians on the scene of the restaurant “Karim Bek”. Working hours: from 08.00 am. till 23.00 pm.